We pursue value in terms of "taste," "nutrition," "health," and "safety & reliability" and apply that value in various products that contribute to the health and joyful living of people. Aiming to develop products that always meet our customers' expectations, we bring together our unique technologies here. Differentiated technologies are indispensable for the best taste. Many of Morinaga Milk's most successful products, from "Mt. RAINIER CAFFÈ LATTE" to "Thick Greek Yogurt PARTHENO" and "PARM（ice cream）," are based on various technologies in combination. 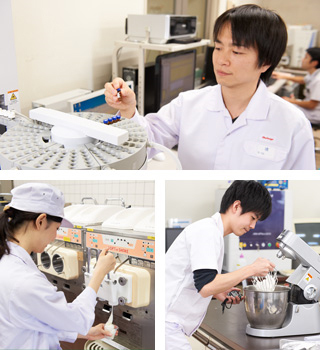 We succeed in producing a steady succession of delicious, creative, high-quality products by focusing on raw material selection and constantly working to exploit newly conceived food processing technologies (including aseptic and sterilized filling, fermentation, and freezing), evaluation technologies based on solid state properties and taste analysis, and packaging technologies to protect flavor, safety, and the environment. We expand the applications and uses of various raw materials to increase the values of "deliciousness" and "health" and to pioneer technologies leading to products with new value. 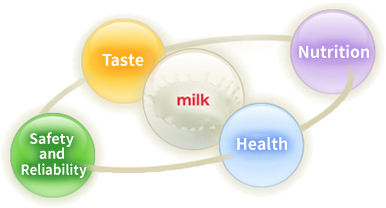 Milk and its various derivatives are used for many foods that support a healthy diet, from powdered milks, creams, and cheeses to other dairy products and dairy derivatives such as milk protein and milk peptide. Functional ingredients such as bifidobacteria and other bacterial powders, lactoferrin, and aloe material also contribute to the maintenance and promotion of people's health. We engage in the technological development of these materials, pursue health functionality, and develop applications that lead to differentiated high-added-value products. We scientifically analyze the processes of nutrition to contribute to people's health and provide foods based on wellness & nutrition science in various fields for consumers of all ages, from babies to seniors. To scientifically analyze the processes of nutrition. Our original research was focused on breast milk. We use results achieved through years of research on nutritional science and advanced studies on health science to develop dry milk powders for the healthy growth of babies, clinical nutritional foods for improved QOL and tailored nutritional management for various diseases, and various upgraded physical functions. Our R&D activities focus on the changing roles of health and nutrition over a person's lifetime as a holistic process and the development of commercial products based on R&D results. 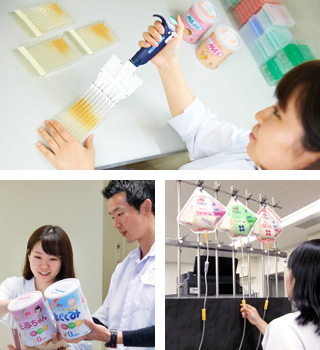 We also develop various nutritional-science-based foods for international business. We study the roles and functions of food in social arenas as health, medical care and the environment to promote innovations that will form foundations for the future. The research theme of "eating" spans beyond food itself to areas such as medical care and social involvement. 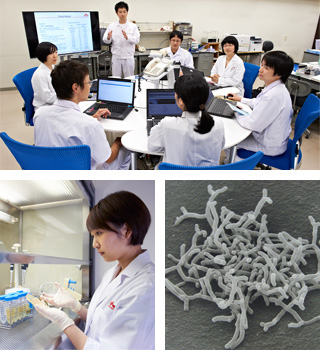 We aim to create new values and establish business foundations for the future by exploring new materials using the most advanced research methods, discovering new functionalities, and clarifying the relationships between life phenomena and elements of the in vivo environment such as intestinal microflora. As professionals focused on application, we develop recipes and evaluate product use from the customer's point of view. We devise and propose recipes that make use of the characteristics of dairy ingredients and the fine flavors of our products to professionals who use our products for businesses such as confectioneries, bakeries, and the restaurant and delicatessen industries, as well as to ordinary customers. We work with external monitors and professionals to evaluate the quality and flavors of our products and product prototypes and the methods to cook them. The results our monitors feed back to us can then be used to develop better products. 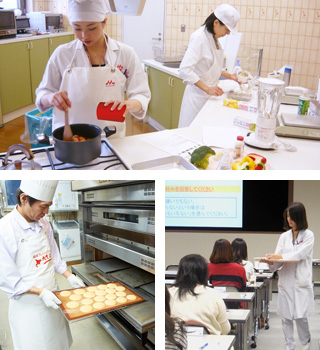 We strictly analyze the characteristics of products from customer standpoints to discover new ways to apply and use our products, and conduct various events such as cooking demonstrations and research presentations. We developing new technologies and production equipment necessary for manufacturing commercial products. To deliver products to the market, we need devices and systems to efficiently and safely manufacture the products. 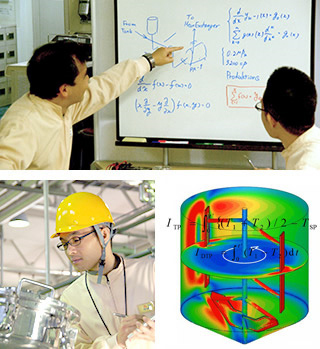 The Engineering Development Center researches and develops "production technology" focused on those devices and systems. The scope of our research is diverse, encompassing basic research on food engineering, manufacturing process technology, production technology for new products, and applied research on advanced technologies that evolve day by day. We have developed a wide range of equipment since our establishment, ranging from ultra-high-temperature sterilization devices, aseptic valves, and direct production devices to automatic inspection devices of various kinds. Our most widely known achievement has been the "PURESTER," a device that generates slightly acidic electrolyzed water using the characteristics of low-concentration-chlorine water for food production. Our laboratories generate various outputs such as tasty foods, healthy foods, functional foods, and much more. We integrate those outputs across our various sections to build an efficient R&D process spanning from development planning to outcome dissemination. 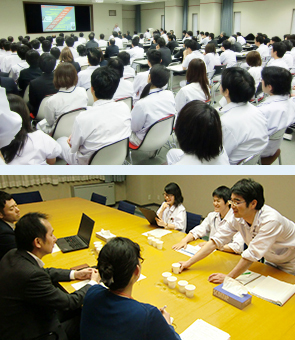 We formulate research strategy in collaboration with the management and business departments, plan various clinical tests for the development of nutritional and functional foods, collect academic information to disseminate to our researchers, handle publicity on research information, and improve the research environment overall.